The sun is setting earlier, and your lights are working longer. 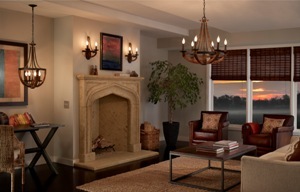 Beautiful lighting will make your home cozy and comfortable. The weather is getting cooler and it’s almost time to fall back one hour. Sometimes simply resetting your alarm clock is not the same as resetting your internal clock. Your bedroom lighting plays a big part in maintaining your natural rhythm and regulating your innate alarm clock. If the lighting in your bedroom is not optimal, you may be grouchy in the morning. For example, if your bedroom windows do not allow enough sunlight to peek into your room in the morning, you may have a more difficult time waking up, because your body won’t recognize that it’s morning. If you’re tired of downing several cups of coffee to start your day, consider installing LED lighting that can emulate the sunrise with dimming features. By utilizing programmable dimming controls, your body can get the wake-up call it needs when natural sunlight is not available. To learn more about innovative lighting technologies that can improve your well being, talk to your local Hortons Home Lighting professional. With winter approaching, one way to get ahead of increased energy costs is to install LED light bulbs throughout your home. LED bulbs are up to five times more energy efficient and last 25 times longer than traditional incandescent bulbs. As the nights become longer, you will likely use your lights for longer periods of time, so why not opt for a lower-cost lighting solution? There are many great LED products available at an ALA-member retailer near you. Don’t let the higher price tag scare you. You will quickly recoup the costs with the energy savings. What is the best can lighting layout around the perimeter of a dining room? In the dining room, it is important to be sure recessed lighting is not placed directly over seating areas. A common detail is to place four recessed fixtures at the corners of the room, approximately 30 inches from each wall. This places a perimeter of light around the table, which supplements any additional lighting, such as a chandelier or pendants.